It's a rarity after the months-long explosion of Guardians of the Galaxy merchandise since the movie came out in August, but look - a Groot statue based on on the comics instead of the movie, and he looks glorious! Just as he did in the movie's climax, the Comic book Groot has a penchant for getting himself blown up in desperate sacrificial acts of heroism to protect his fellow Guardians, requiring whatever splinters left of him to be gathered and 'potted', so a new Groot can grow. And now you can get him as a fancy statue from Gentle Giant. 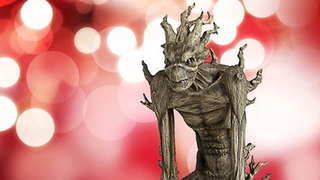 Although it's a bit late for Christmas 2014, this statue also comes with a set of Christmas accoutrements to dress up Groot as a Christmas tree (which seems like a bit of a Jerk move - he's a person who just happens to look like a Tree. Although I guess in his potted form he can't hit you for dressing him up), with everything from working Christmas lights to a gift tag signed by Rocket to drape around the pot. D'aaaw. Gentle Giant's Potted Groot is available for sale now, and will set you back $120 for some Grooty goodness.